This huge freighter went steaming the other day out of the Buffalo harbor, right outside my office window! So I had to stop working and take a picture. There is the ship up above. It is the Adam E. Cornelius! Isn't it the biggest ship you ever saw in your life? Susan Martin is the Home and Garden Editor and she sits next to me and she suggested I look up the Adam E. Cornelius on the Internet which I did. I found this great site called www.boatnerd.com where you can read about the ship here. I learned it was built in 1973 at a cost of $14 million. Adam E. Cornelius was one of the two founding partners of Boland & Cornelius which was the forerunner of American Steamship Lines. 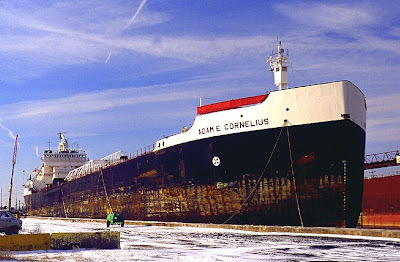 There was another ship called the Adam E. Cornelius built in 1908 but it was scrapped. Here is a picture of the Adam E. Cornelius taken once when it was laid up. Welcome, Adam E. Cornelius, to Buffalo! And Godspeed on your future journeys on the Great Lakes. I wonder if anyone is writing a biography of Adam E. Cornelius the way I am writing one of Leonard Pennario. Perhaps a few months before Adam E. Cornelius died his phone rang and a woman's voice said, "Is this Adam E. Cornelius? Mr. Cornelius, hi! I am a writer for your hometown paper and I would like to ask you a few questions." Meanwhile my journey as Pennario's artistic executor continues. There are still some people left whom I have not been able yet to interview and so this weekend I am writing letters to all of them. I am up to H. The last letter I wrote, which I am looking at right now, is to Jay Heifetz, Jascha Heifetz's son. There are some things I would like to get his take on. Pennario had such colorful memories of Heifetz, Jascha I mean. Pennario called him Jascha. That is how cool Pennario was. He would talk about Heifetz and we would sit around and laugh and laugh. I wish I could do that again, you know? I wish I could go back for even just five minutes. Well, we all have people who are gone we wish that about. After Jay Heifetz the next person will be ... let's see. Paul Hume from the Washington Post is dead. So is the pianist Eugene Istomin. ... is still alive! So Louis Jourdan will be next. 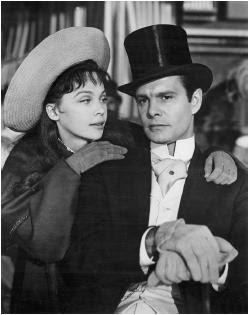 That is Louis Jourdan above in "Gigi," with Leslie Caron. But ay me! Pennario has a Beverly Hills address for Louis Jourdan and I am pretty sure he now lives in France. I think I read that somewhere. Well, no matter. I will write to him in France. Perhaps I will sail there, on the Adam E. Cornelius! Wow! You sure are a busy lady! This is so exciting! The anticipation of the book, that is. I absolutely cannot wait! But, I will have to, I suppose, lol. Heifetz, ah, yes. I put one of his works up on YT a while back. A true master! Good luck with the France letter. If you do have to go there though, perhaps passage on the Adam E. Cornelius would be a good deal. You need to come visit Norfolk harbor, now there are some very large ships! oops! that's Leslie Caron, not Audrey Hepburn... they are both beautlful! Oh, Nancy, you're right. Leslie Caron!! I will have to go and correct my Web log as if the mistake had never occurred. Mark, I will send the Adam E. Cornelius down there to Norfolk to say hi.